Q. Today it wasn't a very tough match for you. Do you prefer before going into the quarterfinals a match like this or would you have preferred a match which is more challenging, or you don't care? RAFAEL NADAL: I cannot choose these things. I don't think going to make a big impact about what's going on. Only important thing is be ready for tomorrow. That going to be a very tough match. David is a tough, tough player on any surface. But here on clay, always a big challenge. I play a lot of matches against him, very tough ones. If you are not at your top, top level, is very difficult to win. I need to be ready for that. I going to try. I think today I played a little bit better than yesterday. For long time I was playing at the good level, I think, changing very well the directions, playing with the right intensity. In 4 1 the second set I stopped a little bit with my legs. Seppi is a player that takes the ball early. If you are not playing from inside, you are in big trouble. I lost a little intensity, I go back, had a few mistakes, I was there. I was lucky to have the break back again. Q. You played against David many times. What will be the key? RAFAEL NADAL: Always is the same key: play very well. Otherwise is impossible against him. He push you to the limit. He has a very, very high intensity. You need to play long. I need to play aggressive. Like this, I going to have chances. If not, all the match going to depend on him, and that's not the right thing. Q. Are you satisfied with the sensations you're having on court? 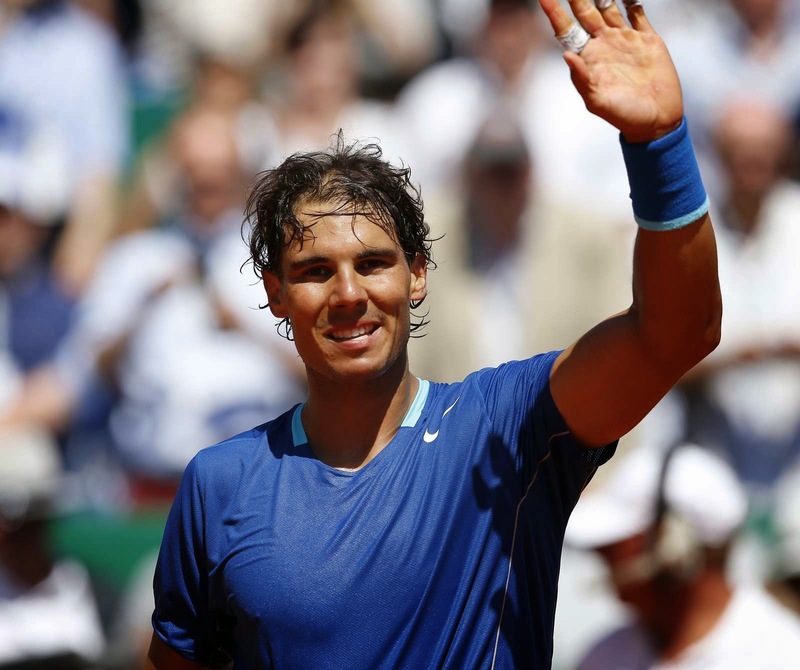 RAFAEL NADAL: Well, I am in quarterfinals. I didn't lose a set. I played little bit better today than yesterday. Yesterday I finished well. Today I started a little bit better. Yes, I did what I had to do to be where I am. Now remain to make one more step to be ready for that. I going to try. Q. You were playing well, then 4 1. Do you think it was more physical than mental? Q. You said you stopped moving with your legs. RAFAEL NADAL: No, is mental. When you stop the legs after five hours and a half in the fifth set, can be physical. When you stop the legs with 6 1, 4 1, is mental. Q. Today Fognini completely lost a match which he should have won. When is the last time you had the feeling in your personal situation that you were able to manage the situation with your mind, with your nerves? How difficult is it and how can you be able to control your nerves? RAFAEL NADAL: Is more a thing of education than another thing. You can always improve during the years. In my case I think from the beginning of my career I was ready to fight. I was ready to accept the tough situations. For one point you cannot have an excuse for the rest of the match. Doesn't matter what happened before. If at the end you didn't fight and you lose the match, who cares why you lost the match. The main thing is you lost the match. So the rest of the things, with the years, you know, doesn't matter, the rest of the things. Q. Did you enjoy yesterday? Do you think Ancelotti is better than Mourinho? RAFAEL NADAL: I am a tennis player. I'm not a football player. To analyze the coaches, you need to practice with them. That's the first thing. You cannot talk about the coaches from like a spectator. Mourinho is an unbelievable coach. He's having unbelievable results. He's fighting for the Premier League, he fighting for the Champions League. Ancelotti doing the same. I think both great coaches. Yesterday was a very emotional match at the end, both fighting for one goal, that's for the Copa del Rey. I am a big fan of Real Madrid and very happy to see the victory of Real. Q. What do you think of Fognini's behavior on court? RAFAEL NADAL: I have a great relationship with him. But he's a good guy. He's a great player. I cannot be stupid, even if he's a friend of mine, and say sometimes he's not right. When he's having some attitudes on court, you know, throwing the racquet all the time to the floor, he's not right. The most important thing is if he knows that or if he doesn't know that. Most important thing is if he knows that, he's able to be critical with himself, you have a good chance to improve. But, well, sometimes with not the best attitude he's No. 13 in the world so that's really amazing. His talent is so big. His level of tennis is great. He's a good guy. He's a fantastic player. What he has to understand, I know he's a good guy because I know him, but all the fans that are in the crowd saw him doing these things, probably they have a different opinion. That's negative for him. So if he's able to understand that, he will change that. He will has, you know, better support from the crowd. For me, when I was playing with him in Miami, is not nice when you see the crowd going against another opponent, against my opponent, and I know the opponent is a good person. If that happens against a bad person, okay, don't care. But he's not like this. He's a good guy. I feel sad sometimes for him because he cannot have the chance to control that situations. But I am sure that he will improve. He's one of the more dangerous players of the tour. And, by the way, he was unlucky today, because he had the match under control.